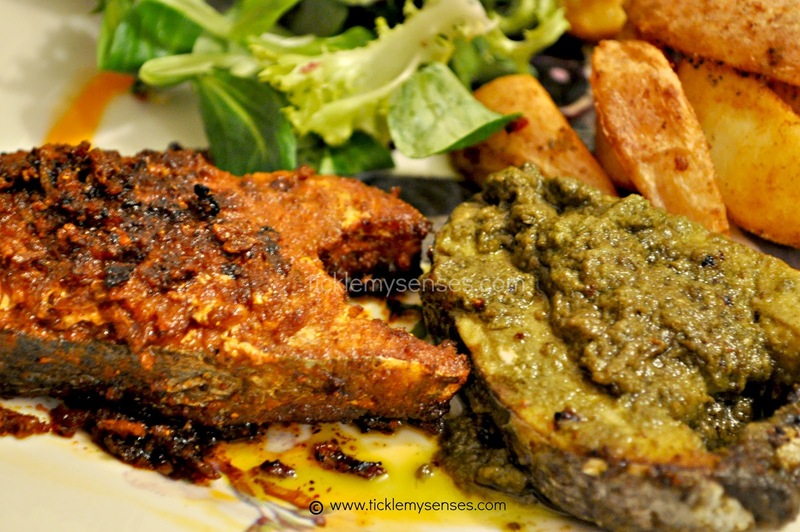 Tickle My Senses: Mangalore Style- Green Masala Baked Fish. This a very simple recipe for a stylish and flavour packed fish preparation. On this plate you will see fish prepared in 2 styles. The left side/red coloured fish is the Mangalore Meet Mirsang style of fish fry using the Meet Mirsang/ chilli paste, which I have posted before. On the right side is the Mangalore Style Green Masala Baked fish, which I will describe today. The flavours and spices of the Mangalore Green masala compliments the fish very well. I prefer to bake the fish with this masala rather than fry it, as the fish tends to retain its moistness and absorbs less oil while baking. But you can use either way to cook it. 1. Take the green masala paste in a small bowl. Add to it about a teaspoonful of vinegar and salt to taste. Add the olive oil and mix well to form a uniform paste. Then apply the paste over the cleaned and dried fish slices on both sides. Keep aside for 20 minutes. 2. Preheat oven to 200C. Place the fish slices on a baking tray in the center of the oven and bake for 10-12 minutes or till done. Serve hot with potato chips and a fresh salad. 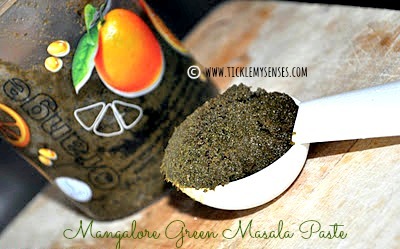 This green masala/ spice paste can also be used to steam fish wrapped in banana / turmeric leaves. wow...its mouth watering !! Looks superb! Carol ... how do u prepare green masala paste... if you dont get ready made paste .. whats the way to prepare the green masala paste..